Despite the fact that Boots has the best customer loyalty scheme anywhere, my interest in the store waned over recent years. This is probably due to my increasingly expensive taste in skincare products and make-up, and the fact that I bore easily. This also has to do with the fact that buying products off the Boots website has been a seriously disenchanting experience, with broken links, understocked items, and an excessive wait for my purchase to arrive. This past weekend I went to the Boots in St Enoch Centre for the first time in months, and it was like rediscovering an old friend. Though I really do like avoiding the crowds and ordering things online, nothing beats the browse, particularly with toiletries. Buying lipstick or perfume online, without the chance to sample the goods, can be a very risky proposition. And there were new brands and new items I was very happy to see. This Boots now sells Barry M cosmetics, so I can restock my beloved Dazzle dust in Mushroom (pictured) without paying a delivery charge. 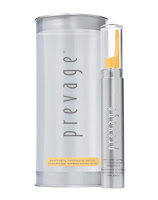 I also came across travel sizes of the Prevage anti-aging treatments for skin and eyes – allowing me to try the products without the hefty £75 price tag. The most exciting feature of the Boots experience though has to be the arrival of self-service checkout. You can use the nifty machine regardless of your method of payment; you can even pay for things with Boots points. And as you’re scanning and bagging everything yourself, you can save yourself the embarrassment of sharing your more personal shopping habits with a cashier. Excellent and useful information presented in this blog, I really like this article. I was looking for these things and here I found it. I am very happy to post my comment on your blog. I'm glad that you shared this helpful info with us. Thanks!